&nbsp; To ensure our messages are delivered properly to your inbox (not bulk or junk folders), add mountaindew@md.mountaindew.com to your Address Book. Click here for instructions. If you haven’t already done so, be sure to join Dewsletter so you won’t miss out on any of the cool sweeps, prizes and more that Mountain Dew has to offer. Click here to join. No purchase necessary. May Dunkin’ Donuts ends 7/1/2011. Void where prohibited. Subject to official rules found at www.pepsiusa.com/memberrules. 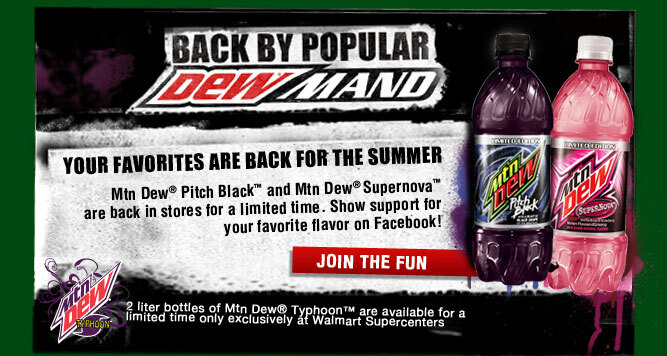 Mountain Dew does not participate in unsolicited email. This is a recurring email and was sent to you because you subscribed to receive promotional emails and updates from Mountain Dew during a previous program or promotion. If you would like to update your profile, click here.